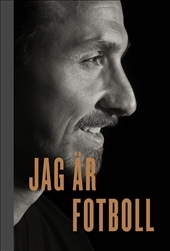 I Am Football is a picture-driven autobiography about Sweden’s greatest football star of all times - Zlatan Ibrahimovic. It follows his football career from the early years at Malmö FF to Manchester United and the move to his current club, LA Galaxy, and gives us a first-hand account of how he went from underdog to superstar, his move from Milan to Paris SG and how he handled his serious knee injury at Manchester United. On top of all that, he tells us about the goals, the victories and the feeling of constantly having to be better in order to be accepted. The book also contains interviews with players, managers and friends that have been part of his journey, including José Mourinho, Paul Pogba, Patrick Vieria, Roland Andersson, Henrik Larsson, Thierry Henry and Mino Raiola, giving us a balanced picture of the man himself. I Am Football is richly illustrated with pictures from Zlatan’s life as a footballer and ends with about 50 pages of statistics from his career between 1999 and 2018, answering questions such as how many minutes he played for at Inter and how many goals he has scored with his right foot. A collection of all the facts for every club he has ever played for and the national Swedish team. The texts in the book have been written together with journalist and author Mats Olsson who has met up with Zlatan on several occasions over the past three years to talk about his football career and carried out all the interviews. In the best-selling biography I Am Zlatan Ibrahimovic: my story that was published in 2011, we followed his journey from Rosengård to becoming one of the best football players in the world. This book, I Am Football, gives us unique insight into his football career.